It’s sandwich panels with rock wood foam and two sides steel plate. 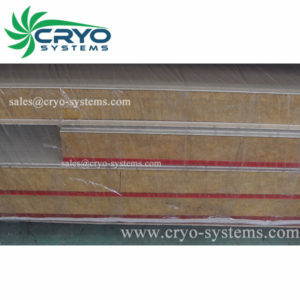 Normally, panels thickness include: 40mm, 50mm, 80mm, 100mm, 120mm, 150mm, 175mm, 200mm. Heat conductivity coefficient (U value) of these panels is 0.043W/(mk). While insulated PUR panels is 0.022W/(mk) and PIR panels is 0.019W/(mk). It means that rock wood panels insulation is not as good as PUR panels, nor the PIR panels. So why there are customers who prefer rock rood panels? First reason is its excellent fireproofing prefermance. Only rock wood insulation panels could reach to A2 fireproofing. While PUR panels could only reach to B2, PIR panels could only reach to B1. 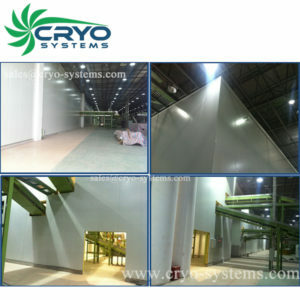 For some specific cold room or some processing room, some building, fireproofing is very important while insulation is not so important. Then we should consider to use rock wood. In one of our test, these panels could bear 1000 degree C fire, lasting 1 hour at least. Second reason is its insulation won’t decrease. 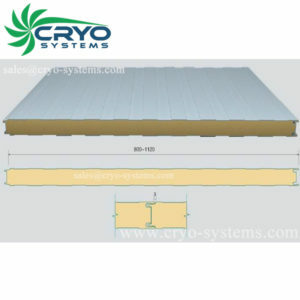 As long as the outside steel casing stay in good condition, its insulation could last 30 years. Below is one of the projects, for tobacco storage.